BuzzinBumble: Celebrating with a "Cookie" Giveaway! 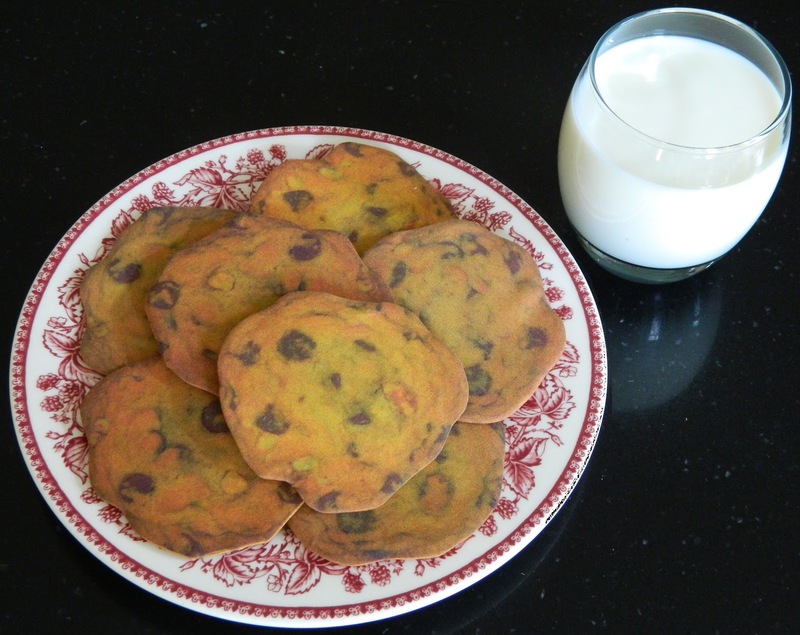 Celebrating with a "Cookie" Giveaway! 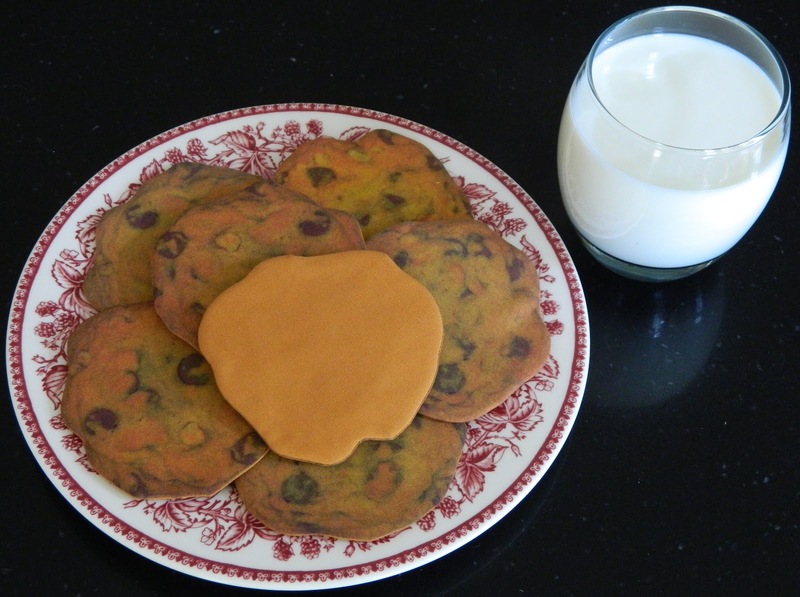 These yummy looking chocolate chip cookies have zero carbs. Yep - It's true! And don't they look mmm-mmm good? Good enough to fool people into thinking they are real, which has happened repeatedly. They are really Cookie Coasters made with fabric that I created on Spoonflower! The funniest reaction I had was when our son Sam came home for the weekend. We had just walked into the kitchen. I had this plate full of cookies on the kitchen table, sitting by the sewing machine, so I could add to it whenever I made another cookie. Sam made a beeline for the table. Jim and I heard a sharp intake of breath, followed by a strangled "What?! Huh?! Argh!" And then he bellowed something rather indelicate. We all died laughing. It wasn't intentional, there was no glass of milk photo prop sitting there, but I got him good. Hee hee. Even though I owe him for a thousand pranks, I made him a batch of real cookies later, because I am a nice mommy. I have a lot to be happy and excited about! I made my book submission deadline for the American Quilter's Society! Woohoo!!! There is still more work coming up, but creating the projects and writing the chapters was the biggest part of the hurdle for me. It was a huge challenge and I am completely tuckered out, but also very happy that I took the leap! To spread around some of that happiness, I am giving away cookie coaster kits to four lucky winners, whose names will be drawn at random. You do not have to be one of my followers or a regular here to enter, although of course that would be great! Each winner will receive a roughly 18" square of cookie fabric, which has 16 whole cookies. They will also receive one fat quarter of Kona cotton in Gold, for the backing of the coasters. "Gold" was the closest match to the cookie fabric. You can see it in the photo below, which shows a flipped over cookie. I made the cookie coasters using the same technique I used for making the Maple Leaf Mug Rugs. The exception is that after turning the cookie right side out, I ironed and then glued the opening shut so that no stitching would show. They make really fun and useful coasters. The fabric would also make a cute apron, or tote, or a pillow front too. It is really fun to design your own fabric on Spoonflower and if you have not tried it before I encourage you to give it a shot! I am not being paid to say this: Spoonflower is so much fun! It is a gathering place for indie fabric designers too, some of whom have gone on to design for major fabric companies. It's also a great place for people like me who just want to play around with a few of their own designs. For these cookies, I had Spoonflower print out the fabric using their Basic Cotton Ultra process - for very sharp color. They offer that if you join their Basic Cotton Ultra Test Squad. I wrote and asked if people could still join and they said this option would be available until they competed the testing. You can get a behind the scenes peek of what the company is all about with Julie Schneider's Spoonflower tour. To enter the contest, just leave me a comment telling me what type of fabric you might make if you created your very own design. I think it would be fun for everyone to read about each others ideas! Also - please make sure you are not a "no reply" commenter. If you win and I am unable to contact you, I will have to re-award the prize to someone else. We will randomly select and announce the names of the four winners on November 22nd. Linking up to Sarah Craig's Whoop Whoop Friday! Linking up to Heather and Megan's Fabric Tuesday! Linking up to Lorna's Let's Bee Social! Linking up to Kelly's Needle and Thread Thursday! I really do follow a lot of links from every linky party I join - it is such fun to see what everyone has been up to! Too funny about your son :D This fabric is fantastic and delicious, Lara. If I were to design a fabric, I might go with something art deco is luscious jewel tones. Those are so cute!! My Hubby would have been so mad at me that they weren't real... lol. Great job, and they sure do look yummy! I love your cookies! I love "food" fabric, so that might be an option, or maybe a photograph of a quilt my grandmother made, that would be fun, or even photos of my cats! It's good to see you back in the loop! Nice job with the cookies, they look delicious! I'm so glad to see you met your deadline! You had me missing my chocolate there for a second, well they still look good...lol! Congratulations on meeting your deadline! That must feel wonderful. Love that your son was fooled by the cookie coasters! Such a crack up post! Congrats on you book submission! Can't wait!!! Oh a bolt of fabric if my second graders drawings would be wonderful!!! OMG, that is hilarious that your son thought they were real cookies. LOL I would have died laughing. That sounds like something my sister would do ... to me! If I was to design my own fabric, I think it would have to be something modern in black and white, maybe with a splash of red too. I've been thinking about creating some fabric labels using Spoonflower. Congratulations on meeting your deadline Lara and welcome back! I'm wondering now how many people I might fool with fake cookies :-) If I were designing a fabric I would base it on runner/french beans - I love how they grow up cane tripods, I love the green with their pretty flowers and I love the shape of the beans against the foliage. These quilty cookies are really adorable! Maybe I'd like slices of pizza... with several different topping! Congratulations for making your big deadline!! I know it is going to be an awesome book, Lara! Congratulations on meeting your deadline! That's great! Well done! Such heroic achievement might even land you with the next contract! About the fabric design - I allways thought that stone, especially diiferent granite, would be a great source for a fabric design. WOOOOO on the deadline! BWAHAHAHAHAHA on "tricking" your son. AWWWWW because you're such a sweet mom! Those cookie coasters are DARLING!!! Such a fun Christmas gift idea even. A plate of cookie coasters left at your door? How fun would that be? Hmmmm...fabric design. Honestly I have so many ideas and most of them revolve around rosemaling right now...probably because I've watched Frozen one too many times. But, I'd also like to make some fabric of the pumpkin in my logo for packing fun goodies for people. :) I've never tried Spoonflower. I'll have to give it a go sometime. Congratulations on meeting your dealine and getting one step closer to the finish line. Your coasters are super cute and they look like real cookes no wonder your son got tricked into thinking they were real cookies. I don't know what I would desing... I'm thinkig something with geometric shapes. That plate of cookies looks so real!! What a fun giveaway. And congratulations on meeting your deadline. It must be exciting to be at that stage. I think if I were to design fabric it would be a blender, something tone-on-tone, but I have no idea what sort of print I would use. Thanks for the chance to win. Oh wow, those look so REAL! I think they would be a hazard in our house, as no cookie is ever safe. Congrats on getting the book submitted! Hm...fabric design...either something nature-related or something really wild and funky. I gravitate between the two extremes, lol. Great story and fabric! I haven't tried spoonflower yet but want to. My first thought was something with poodles on it doing art stuff. That would be awesome. Thanks for the chance to win. Ha, I totally thought those were cookies in the thumbnail! What a funny story! I haven't bought anything from Spoonflower, but I like to vote on their fabrics on Fridays. I would probably have them make me some geometrics in tone-on-tone fabrics. Oh yes...I need these 'cookies'! Thanks so much for the chance to win some of this fabulous fabric. Congratulations on the progress made with your book, Lara! That's quite an accomplishment. Your cookies do look really yummy. You are a good mommy for making some real ones too! Your cookies look so yummy and I never would have guessed they were fabric! I hope you ended up making your hubby some "real" cookies! I have been wanting to design some fabric and have it printed at Spoonflower. I have a little kitty applique that I have been thinking of printing. I am taking a Illustrator class on Surface Pattern Design and there was a video all about Spoonflower. I recently placed my first order at Spoonflower. If I were to design fabric it would involve red oriental poppies. Linda, thank you for stopping by. If you happen to check back on BuzzinBumble, you might want to change your status. Currently you are a no-reply commenter. If you should happen to win the drawing I would not able able to contact you. I've been thinking about having fabric with photos of my dogs made. I would like to make stuffed pillows from that fabric. It's not my original idea but I think it's a great one. I love your cookie coasters. They are absolutely fantastic! Hi Ilana, Thank you for comment! Stuffed pillows from photos of your dogs is an idea right after my own heart! I am replying here because you are a no-reply commenter. I hope you check back here before Saturday and can either change your status or let me know how to contact you in case you happen to be one of the cookie fabric winners. The cookies looked real....but there was a strange cast to them...just wasn't sure what was up with them. They are just darling! I guess I'd make some fabric with my past pets on them. Thanks for the giveaway....these are just darling! I think I would make M&M peanut fabric. My hubby actually bit into a bit of "fudge" that was soap that I had made and scented with chocolate so I would like to get him again with cookies. How great is this? OMG--zero calorie cookies! Vintage Holiday Wreath Fabric Winners! Cats on Quilts - by Alina B.